Ancient travellers found much needed food, rest and supplies in the oases and watering holes of North Africa, in the dim-sum tea houses houses of southern China or the dhabas that still dot the Indian highways. For the modern jet-set traveller, business hotels attempt do the same - some a little better than others. 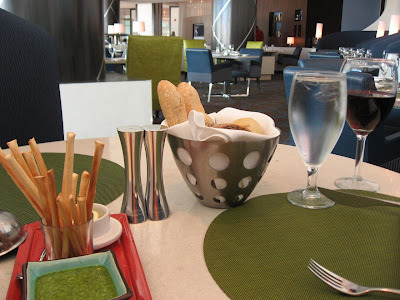 Here's a quick post of my memorable food moments within business hotels during this trip to the Bay Area. Having spent the previous 24 hours on an airplane, all I wanted was a quick dinner so I could hit the bed, which looked very welcoming indeed. Bay 223, the restaurant of the Sofitel is bright, cheerful. The food here - a mix of American and French influences - can be quite good. 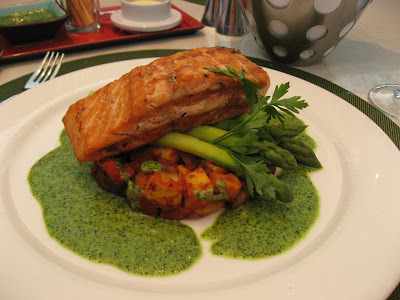 Here are pictures of the potato-burnt garlic soup and the grilled salmon on a bed of ratatouille with pesto sauce. 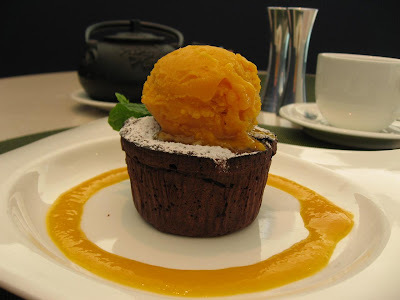 The chocolate-mango sorbet combination of my dessert was a nice touch too! I actually two meetings on Sunday. One during lunch, the other over dinner. 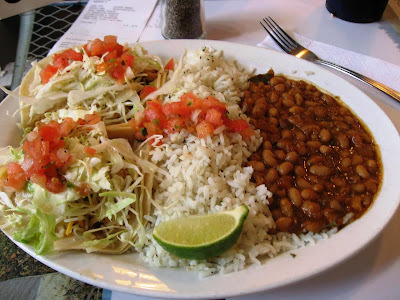 We grabbed lunch at Wahoo's Fish Tacos at Santana Row. Wahoo's is an interesting spin on Mexican food. 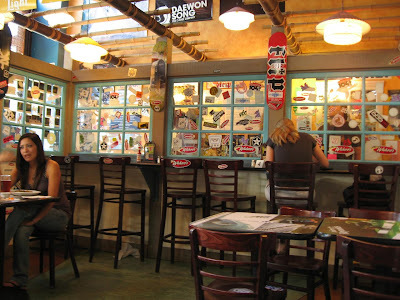 A casual, outdoor ambiance - lots of surfing memorabilia - their signature dish are the Fish Tacos which I ordered along with their spicy white beans. For my dinner meeting, I went over to the nearby Four Seasons hotel in Palo Alto. 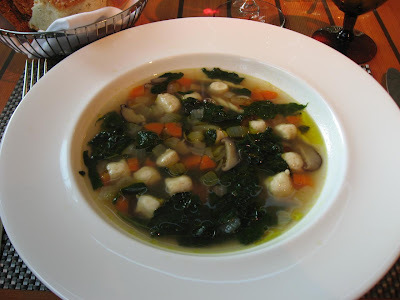 It's Italian restaurant, Quattro, offers a Sunday supper menu which we decided to go with. 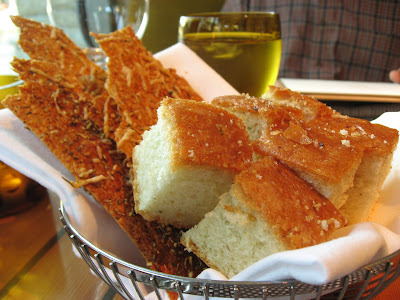 Quattro features Northern Italian seasonal and light cuisine with an fresh Cal-Italian twist at breakfast and lunch. We began with the Jota Soup with Savoy Cabbage, Borlotti Beans, Poached Egg. The soup was good, especially since my jet-lag was now begining to hit me! 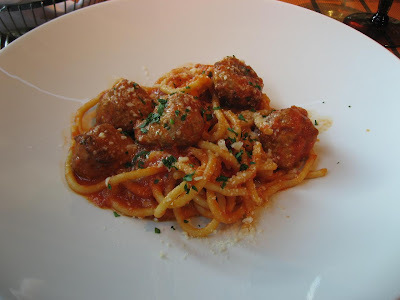 The house-made Spaghettoni with Mamma Cartumini’s Famous Meatballs was not bad. 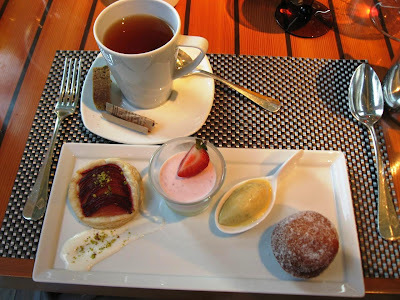 But what I liked most was the seasonal dessert sampler: check out the pictures below. 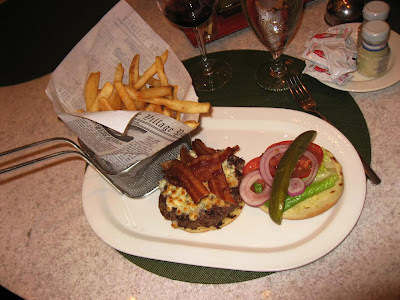 On another evening, after a day full of meetings I ordered a Cheeseburger at Bay 223. Look at the interesting way my French Fries were served. And yes, the cheeseburger was pretty good - I had decided to choose blue cheese, which main the burger a little more interesting than usual. And finally, the excellent Palomar hotel in downtown San Francisco. 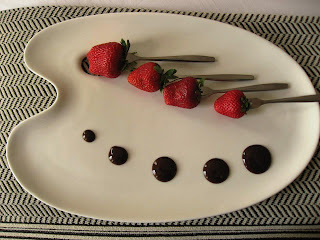 They surprised me with a platter of very artfully presented strawberries with chocolate sauce! 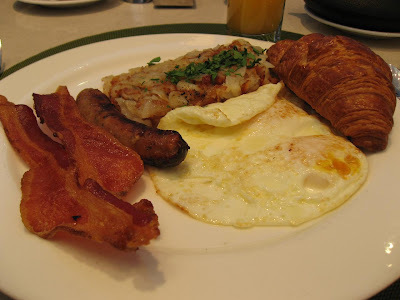 The hearty breakfast in the morning was good enough to keep me going through the busy day too. The last week has been particularly maddening here: I was moving house, there was a crisis at work and now we seem to have a near-panic situation in Pune due to swine-flu. The good news is, the coming weeks can only be better! Good to see you back in action after a while!! What appetizing pictures. The pictures of tacos made me realize how much I miss Mexican food here. I am yet to have a good Quesadilla or taco or for that matter good salsa or guacamole. Blogtrotter is now showing that Reykjavik is not entirely grey... ;)). Enjoy and have a fabulous week! @vamsee: I am looking forward to reading your blog post. I have been flooded lately; lot of catching up to do. What always amazes me in your quest for the perfect food is the attention to details in these restaurants. These plates are just art, I'd almost be afraid to destroy the food! Beautiful artistic presentation, but I bet they are four of the most expensive strawberries you'll ever eat. these are really yum! it's dinner time here, and i'd love to have that garlic soup. sounds so delicious! Mouth watering post as usual. Pune is all over "Braking news" isn't it and for all the wrong reasons!!! Its 12 am here and reading your post has made me ravenous, and I am on a diet woe me!!!! 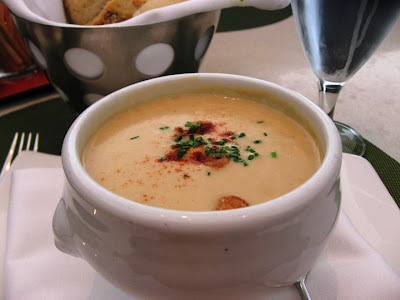 This post reminded me that Kiva in Pune has some amazing burnt-garlic soup. @Zhu: Thank you! Yes, the cutlery has kept up with the food, hasn't it? @Mark: Haha! Thankfully, they were complimentary. @Deepti: Oh yes. It's been unreal in Pune during last week. @Random Magus: Good to see you back in the blog world. @Nikita: Actually, it is Mainland China where I like my burnt garlic soup. that dish looks so cute!